Surface 2 and Surface Pro 2 launched by Microsoft | What Hi-Fi? 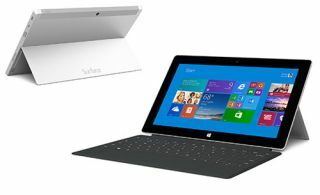 Microsoft has announced two additions to the Surface tablet family, the Surface 2 and the Surface Pro 2. The successors to the Surface RT and Surface Pro, you might have guessed, claim significant updates, with Surface CEO Panos Panay claimed these new tablets would continue to help "people get away from their iPads and be more productive". The new Surface 2 tablet will run on Windows RT 8.1. This is the tablet Microsoft hopes will take on the iPad, offering a mix of features aimed at delivering a solution for business and personal use. The Surface 2 is powered by an NVIDIA Tegra 4 Processor which aims to help make apps run faster and increase battery life for video playback to up to 10 hours. The 2.0 USB port from the Surface RT has been upgraded to USB 3.0 for up to four times faster file transfers and the ClearType Full HD display now renders 1080p video for watching movies. Other areas of improvement include the camera resolution, with a 3.5 MP front camera and 5 MP rear camera. The new Microsoft Surface 2 is also slightly thinner and lighter than the previous model, while the Kickstand has been updated to feature 2 positions. The Windows RT 8.1 OS offers improvements in areas such as personalisation, built in apps and the Windows store experience. One of the setbacks of the Surface RT was the limited selection of apps, so it'll be interesting to see what's on offer this time. There's a new xBox Music feature that enables users to stream music for free, while students will appreciate the fact that the Surface 2 is pre-loaded with Office Home & Student 2013 RT and Microsoft Outlook 2013 RT. The Surface 2 will launch in the UK at the same time as in the US and is priced at £349 for the 32GB model, £439 for th 64GB device. The Surface Pro 2 meanwhile replaces the original Surface Pro and acts as a "true laptop replacement", claiming to offer the simplicity of a tablet and the power of a laptop. It is capable of running all Windows software alongside apps from the Windows store and is powered by the fourth generation Intel Core i5 processor, which offers a 75% increase in battery life compared to the Surface Pro. The Surface Pro 2 is priced at £719 for the 64GB model, £799 for the 128GB (both with 4GB RAM), or £1039 for the 256GB, £1.439 for the 512GB model (both with 8GB RAM). Both tablets have been launched alongside a range of Surface accessories, which include a docking station, protective covers and adapters. You can order a new Microsoft Surface tablet from today, with the release date for the new Surface tablets scheduled at October 22nd.